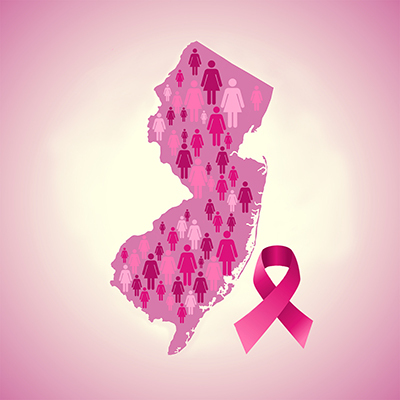 New Brunswick, N.J. – When it comes to breast cancer subtype in the Garden State, researchers from Rutgers University and the New Jersey State Cancer Registry find that non-Hispanic black women and women between the ages of 20 to 39 have higher rates of triple-negative disease than females aged 50 to 64 and those of other races and ethnicities. Senior author Adana A.M. Llanos, PhD, MPH, along with co-author and New Jersey State Cancer Registry Director Antoinette Stroup, PhD, both of Rutgers Cancer Institute of New Jersey and Rutgers School of Public Health, share more about the work which appears in the July 2018 online issue of Cancer Health Disparities (doi:10.9777/chd.2018.10023). Q: Why is this topic important to explore? A: Exploring the distributions of breast cancer subtypes among the racially and ethnically diverse populations of women in New Jersey is important so that we better understand the persistent disparities in breast cancer outcomes. These results can inform clinical and population-health initiatives aimed at disseminating optimal treatment across populations and contribute to the goal of achieving health equity. Q: How was this study conducted? A: This study involved retrieving data from existing records at the New Jersey State Cancer Registry (NJSCR) for all primary, histologically confirmed, invasive breast cancers diagnosed among women of all races/ethnicities in New Jersey from January 1, 2008 through December 31, 2013. This allowed us to establish an analytic dataset of almost 33,000 breast cancer cases with data on estrogen receptor (ER), progesterone receptor (PR), and HER2 status. The combination of ER, PR, and HER2 status was used to classify breast cancer subtypes. Using breast cancer subtype data, we estimated breast cancer incidence and mortality by subtype, exploring variation by age at diagnosis, race/ethnicity. Q: What did you learn? A: Our major findings were that non-Hispanic Black (NHB) women had the highest triple-negative breast cancer (TNBC) incidence rate (17.8 cases per 100,000 people) compared to other races/ethnicities. NHB women diagnosed with TNBC, luminal A or luminal B breast cancers also had poorer survival outcomes than non-Hispanic White (NHW) women. In addition, younger women (20 to 39 years of age) had higher odds of developing TNBC and luminal B breast cancer than women 50 to 64 years, and the TNBC subtype was associated with the poorest breast cancer survival rates. Q: What is the implication of these findings? A: These findings highlight a need to consider enhanced screening and education to promote earlier diagnosis among some groups of women in New Jersey -- particularly racial/ethnic minorities and younger women. These findings also indicate that there is a need to address the relatively poor survival observed among women diagnosed with TNBC. Additionally, understanding the mechanisms leading to the development of each breast cancer subtype is essential to cancer prevention and control; will play a major role in improving breast cancer prognosis and addressing breast cancer outcomes disparities across populations; and, may contribute to improved treatment options that will hopefully reduce the observed breast cancer mortality and survival differences by molecular subtype. Along with Drs. Llanos and Stroup, the other authors on the research are Aishwarya Kulkarni, MPH, and Lisa E. Paddock, PhD, MPH, both of Rutgers School of Public Health, Rutgers Cancer Institute and New Jersey State Cancer Registry; Stephanie M. Hill, MPH, CTR, Rutgers Cancer Institute and New Jersey State Cancer Registry; and Jesse J. Plascak, PhD, Rutgers School of Public Health and Rutgers Cancer Institute. This work was supported in part by grants from the National Cancer Institute (Cancer Center Support Grant Number P30 CA072720) through a New Investigator Award and K01 CA193527 awarded to A.A.M. Llanos. Cancer Epidemiology Services, including the New Jersey State Cancer Registry, receives financial support from the: Surveillance, Epidemiology, and End Results Program of the National Cancer Institute, National Institutes of Health, under contract HHSN 261201300021I and control No. N01-PC-2013-00021; National Program of Cancer Registries, Centers for Disease Control and Prevention, under cooperative agreement 5U58/ DP003931; the State of New Jersey and Rutgers Cancer Institute of New Jersey. For patient appointments/inquiries call 732-235-8515.